"A modern spectator, still under the influence of [a] Romantic interpretation of art, finds it uninteresting, if not distressing, when the historian tells him that a rational system of proportions, or even a definite geometrical scheme, underlies this or that representation." Turning to the Sacred and Profane Love, there are no indicators to any structured demands of perspective, rather, the sculptural volume of the centrally placed figurative suite (the two women, the child and the fountain/sarcophagus) appear almost unrelated to the surrounding iconography. The dominant source of perceived ‘distance’ is implied by a diminutive pastoral iconography surrounding the grand suite of figures. This is to say that the background iconography appears mathematically unrelated to the central grouping, for example; due only to the smaller proportions of the castle at the paintings left, it appears to be at a distance as do, to a lesser degree, the two hares directly below the castle. To the right of the painting various idyllic and pastoral themes are at play and yet, perceived distance or relative tension between those ciphers seem to be randomly scattered about the large suite of figures, all of which upon closer scrutiny, appear to be disconcertingly disproportionate. The more one ponders the Sacred and Profane Love the more one becomes literally disillusioned in accepting this work as a form of artifice developed around a central vanishing point (or points) in accordance with the laws of perspective. No doubt an overall sense of harmony greets the eye, but to the mind, the proportions appear mathematically illogical. There are several types of pictorial arrangements where symbol and motif rely on radically different systems of design. One may be a patterned symbolic arrangement and another, a geometric pattern, or even perhaps a mathematically based system of proportion. Again; taken individually, the use of perspective law offers no intended or direct communicative value in practice because the science of perspective may be visually appreciated regardless of subject matter. This is not because we are ignorant of the idea, but because we already know that perspective law was the idea. Perspective in the general context of the Renaissance is (tellingly) as a visual vehicle rather than specific language beyond its genre. There are distinct approaches to the execution of perspective that over time, reveal development from one era to the next - but this is not often a narration or conversation by the artist on a specific topic that perspective alone can articulate; it is more a 'warp and weft' system into which design and idea are interwoven: See Chronological shifts and individual takes of linear perspective. Molinari's clarification reminds us that the mathematical method is as artificial as any other method: a method which at worst probably bears the stamp of a voyeuristic, keyhole culture - which in part began with Brunelleschi's hole in the baptistery panel. Because a painting is more a plot than a photograph, the symbolic is the ideal where there are those who understand the import of the particular symbol as an indicator of metaphoric language. Number symbolism, perspective, geometric schema; all of these methods, distinct in intention as they are, may be placed under the qualification of ‘substructural geometry’, because the visually unifying nature of geometry (or pattern or plot), are really the development of a ‘methodology of foundation’ and are of an equitable value when reduced to formularized schematic intentions or considered as 'conceptual armatures'. In the above excerpt, it appears that to Galileo - who had himself considered donning the painters mantle - a paintings conceptual arrangement should be no less rigorous than any logical argument advanced by the most ardent thinker. Although Galileo was certainly at the later end of the Renaissance, these thoughts express a learned distaste for random marking posing as erudition. "The design and structure of the Sacred and Profane Love appears to bear no relationship to the design structures based around visual perspective that were being produced in the painters workshops of the period." 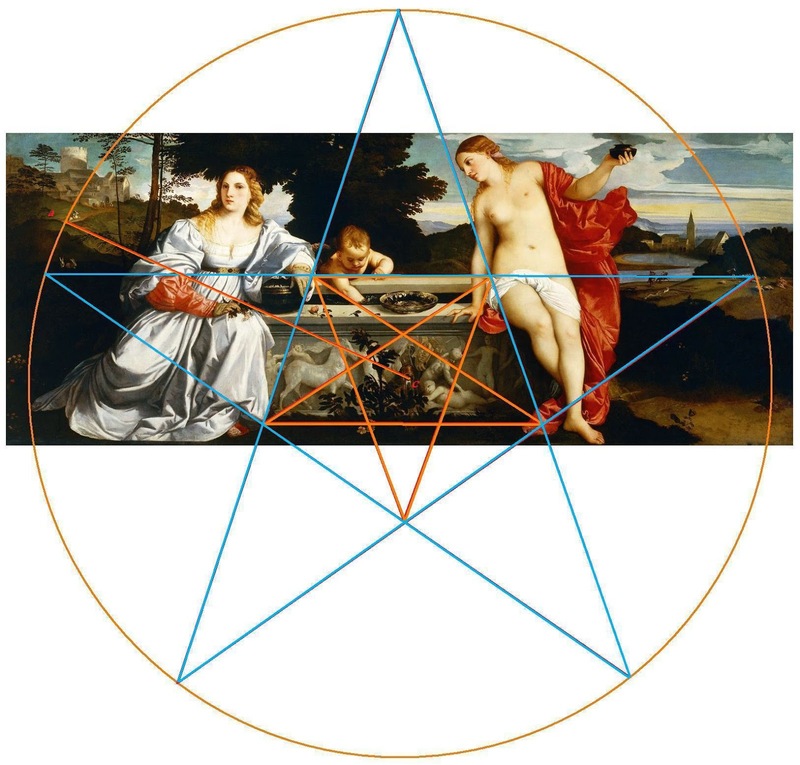 As a conceptual schematic of a religious type, the Sacred and Profane Love has been stripped of any possible religious passion and traced to the most abstract of geometric sources. Overall one can conclude that the proposition of the Sacred and Profane Love is religious, but only in the driest, academic sense of scrutiny tempered by emotional neutrality - a curious feat to achieve in fifteenth century Venice. All of this will lend gravity to the notion that during the Renaissance, the humanist advisor could be responsible for advancing learned considerations on the behalf of the patrons who were the financial source for a great deal of commissioned artworks. The influence of the humanist advisor can be found in the conceptual structures of the Sacred and Profane Love where the advisor appears to have devised an entire symbolic programme (invenzione). While it is most unlikely that the advisor would tread upon the artists ground by forwarding a programme outlining a preferred method of perspective, it is extremely plausible that a programme could be advanced where both classical narrative and symbolism were synthesized into a rigid form of invenzione. It should also be considered that the while the advisor might desire the design to be inflexible, the patron may well have had leanings toward a more decorative - and so flexible - sensibility. Among the many names associated with the Italian lineage of geometric perspective were Brunelleschi (1377-1446), often considered the father of perspective; his influence on Donatello (1386-1446)and Massaccio (1401-1428). The writings of and works of Alberti (1404 - 1474) were also influential and the works of Vitruvius (1st century B.C.E.) were available and clearly influenced da Vinci (1452-1519) - as evidenced in the work known as the Vitruvian man. Again, symbolic and perspective schematics within the history of painting can only have been created within the context of a cultures capacity to develop these systems of construction and the same cultures enthusiasm and appreciation of such works. We know that the advance of the Renaissance was created and marked with the rise of wealth and education: Under these conditions it might be prudent to consider all forms of geometric complexity as an intellectual hunger satiated by the desire to improve one’s conceptual capacity beyond the boundaries of simple objective representation and find a means to participate in and align the arts to the driven intellectualism that was the Italian Renaissance. While the ‘scientific’ area of perspective geometry evolved into a studious methodology for religious and secular painting under the direction of the guilds, curious forms of geometric consideration were most likely born of Byzantine and medieval monastic manuscripts and their disciplined two dimensional representations. But to where and to whom might we turn to definitively determine a lineage of symbolic geometry?